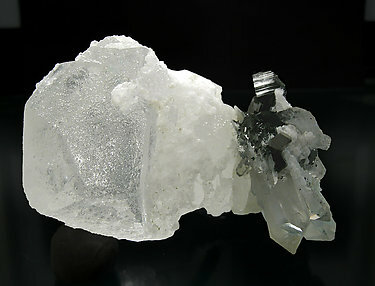 Crystals, very definite and bright, grown on a Quartz group standing on a Calcite crystal. We’ll give a copy of the analysis to the buyer. Complete and doubly terminated Babingtonite crystal with excellent terminations, very well defined faces and edges, polycrystalline growths and very bright surfaces. 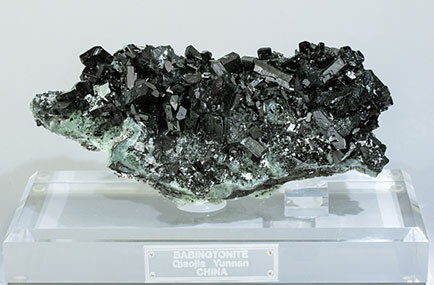 These Chinese Babingtonites have almost disappeared from the mineral market and the best are those that first appeared. Very aerial group of very sharp and flattened crystals, a lot of them doubly terminated. 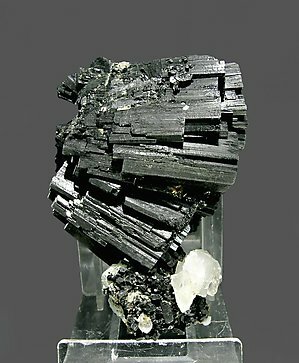 They are bright with a deep black color and are on a matrix of botryoidal Prehnite. 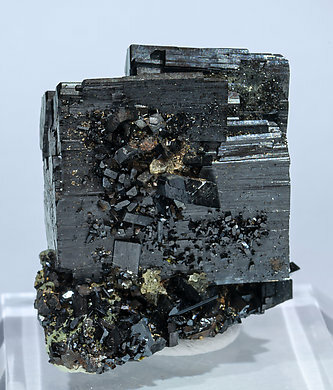 These Chinese Babingtonites have almost disappeared from the mineral market and the best are those that first appeared. 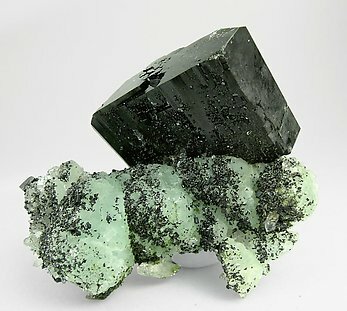 On Prehnite, a big quantity of small Babingtonite crystals, but one of these crystals is very much bigger, doubly-terminated, bright and very sharp. We’ll give a copy of the analysis to the buyer. The specimen has been published in the magazine ‘Lapis’ on page 24, volume 33, number 6, June 2008. A sample of a very rare quality, a group of extremely sharp crystals, really large for the species, with very well defined faces and edges, undamaged , bright, with perfect terminations and on a matrix of aggregates of clear green crystals of Prehnite. A sample worth belonging to the best museums or private collections. Group of doubly terminated crystals of Babingtonite. They have a more than considerable size for the species. They are on a matrix of Prehnite with Quartz. This specimen was photographed for the ‘Sainte-Marie Show 2008’ section of the magazine ‘Minéraux et Fossiles’ and appears on page 24 of number 373. We will send the purchaser a copy of the magazine. Crystals are very big, exceptional for the species. They grew, with the Quartz, on a Prehnite matrix and they are doubly-terminated. We’ll give a copy of the analysis to the buyer. 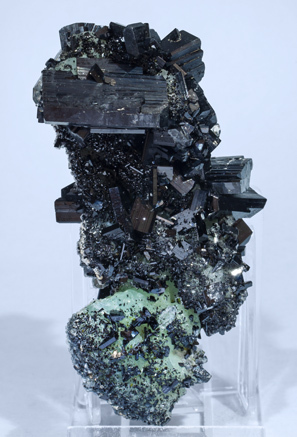 The specimen has been reviewed, photographed and published as a new discovery in the magazine ‘‘Mineral Up’’ on page 22 in number 2006/1. 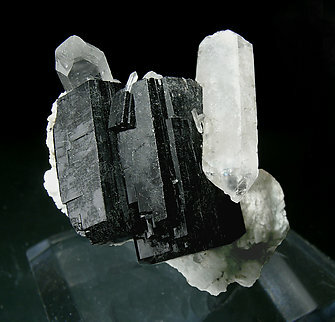 An excellent example with a Babingtonite crystal, quite large for the species. It has very well defined faces and edges with perfect terminations, and, most importantly, they are very bright. 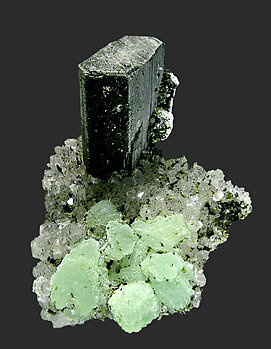 It is on a matrix of green botryoidal Prehnite and small crystals of Quartz. A definitive piece. Extraordinary group of sharp Babingtonite crystals. They are very bright and with perfect terminations, on matrix with Prehnite and Quartz. A museum piece. 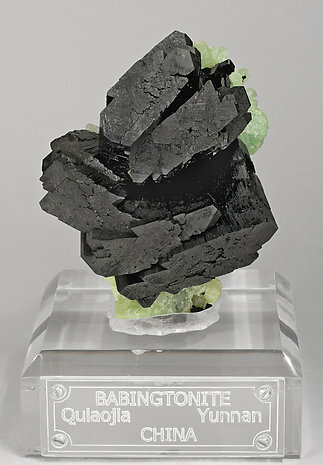 Doubly terminated crystal of Babingtonite with very sharp faces and edges and a considerable size. 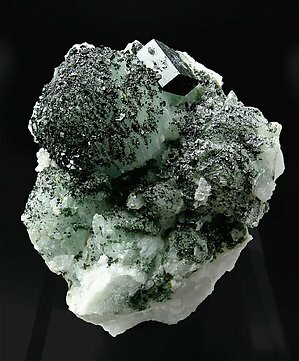 The matrix is a group of small Quartz crystals with spheroidal Prehnite and small crystals of Epidote. Very esthetic.